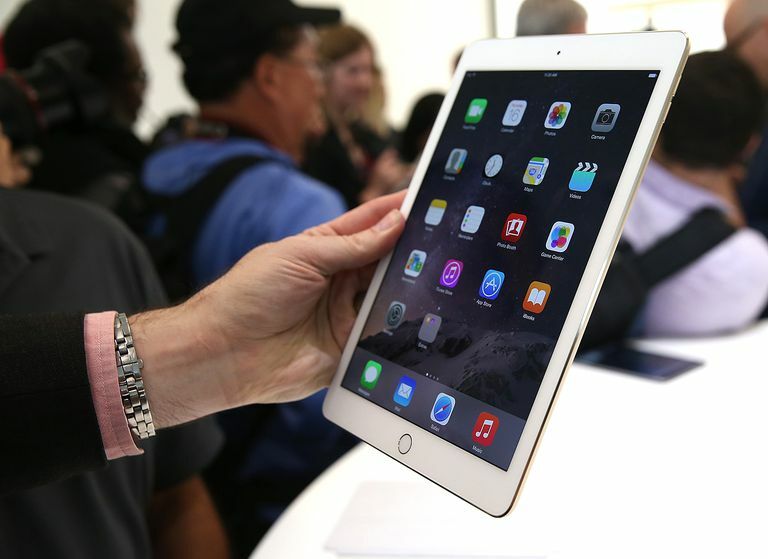 Should You Upgrade to the iPad Air 2? Apple's iPad Air 2 announcement didn't generate any major announcements for the iPad lineup, but it does constitute a beefy upgrade from the iPad Air. Apple's newest flagship tablet receives a 40% boost in processor speed and around a 250% increase in performance for graphics. It's powered by a new A8X chip, which is an enhanced version of the A8 chip found in iPhone 6 and iPhone 6 Plus. The new iPad also receives the Touch ID fingerprint sensor that debuted with the iPhone 5. Touch ID has grown up in the last year, with Apple allowing third-party apps to use Touch ID to replace your standard username-password login. This provides a much faster and a much more secure way of logging into your apps, which will be a great boon for apps that hold sensitive information. Touch ID is also used in Apple's new Apple Pay electronic wallet solution, though the iPad Air 2 can only make payments online. It doesn't have the near-field communications (NFC) chip required to pay at a brick-and-mortar store. The iPad Air 2 also received a nice upgrade to the camera, jumping from 5 MP to 8 MP. This puts it on par with the back-facing cameras found on the iPhone, though the iPhone 6 and iPhone 6 Plus still have a few features that give their cameras an edge. And Apple hasn't forgotten Wi-Fi. The iPad Air 2 supports 802.11ac, which is the latest standard in Wi-Fi communications. This is great for those (few) who have an 802.11ac router. Absolutely. The original iPad is essentially obsolete. It doesn't support the last two major operating system releases (iOS 6 and iOS 7) and is quickly losing app support. The iPad Air 2 uses a 64-bit processor and has all the latest and greatest features, including Touch ID. This means it will be supported for years to come as Apple grows the iPad line. The choice for owners of the original iPad isn't if they should upgrade, it is whether to upgrade to the iPad Air 2 or get a deal by going with the $299 iPad Mini 2, which is basically a smaller version of last year's iPad Air. The iPad 2 was kept in production for longer than any other iPad, but it is definitely beginning to show its age. The iPad Air 2 is over 8 times faster than the iPad 2, and in terms of graphics, the iPad Air 2 blows it off the charts. The iPad 2 has horrible front-facing and back-facing cameras doesn't have the Retina Display, doesn't support 4G speeds, doesn't have Touch ID. Worst, it seems a little clunky when using the new iOS 8 operating system. This is a sure sign that Apple is going to cut off support in the future, perhaps sooner rather than later. The iPad 2 has had a great run, but it is time to retire it. The iPad Mini is now Apple's entry-level iPad. The price has been dropped to $249, which is sure to lure in some buyers that were contemplating one of the cheaper Android tablets. But don't let Apple fool you. Just because they are keeping it in production doesn't mean it isn't long in the tooth. The iPad Mini may have better cameras, 4G support and a nicer form factor, but on the inside, it is still an iPad 2, powered by the same iPad 2 processor. It's a nice tablet, but the jump to the new iPad Air 2 is a huge one and one that any iPad Mini owner should contemplate. If price is a concern, the iPad Mini 2 is $200 cheaper than the iPad Air 2 and is still a very nice upgrade from the iPad Mini. The iPad 3 was the most short-lived iPad, including the original iPad. Released in Spring of 2012, its successor was announced just eight months later. However, unlike the original iPad, it still supports most of the latest-and-greatest features, including Siri, leaving AirDrop as the only major feature not supported on the iPad 3. One reason why the iPad 3 received such a quick upgrade was Apple's desire to move to a Fall release schedule, positioning the iPad as a great Christmas gift. Another reason that played into Apple's decision was the A5X chipset powering the iPad 3. This was essentially the same CPU powering the iPad 2 with a more powerful graphics processor included to help power the Retina Display screen. Like the iPad 2 and the iPad Mini, the iPad 3 is starting to show its age. The upgraded graphics processor makes it more able to tackle the latest games, but it is still a good time to upgrade. The iPad 4 is Apple's last iPad with a 32-bit processor. This is important. At some point, Apple may draw the line to stop supporting the older 32-bit iPads. But don't worry, that isn't likely to happen for several more years, and the next line in the sand Apple draws will probably leave out the iPad 2 and leave in the iPad 4. And while not as fast as the newer iPad Air and iPad Air 2, the iPad 4 is still plenty fast. It tackled the iOS 8 update like a champ. It has great front-facing and back-facing cameras, supports 4G LTE and can do just about anything the iPad Air 2 can do, with the Air 2's Touch ID system being the biggest notable exception. The one area that might make iPad 4 owners (or even iPad Air owners) think about a jump to the iPad Air 2 is Apple's decision to replace the 32 GB version with the 64 GB version. If you have a 16 GB iPad and find the storage too confining, the $599 iPad Air 2 with 64 GB of storage might make sense. Upgrade Recommendation: No need to upgrade. Is it too early to upgrade if you just bought your iPad last year? The only reason to contemplate a jump from the Air to the Air 2 is if you really, really, really want to unlock your iPad with your thumb. And while it sounds silly, it might be worth it to those who have Touch ID on their phone and are tired of constantly trying to unlock the iPad using a non-existent Touch ID sensor. But even if you could get $350 for selling the entry-level iPad Air, that would still leave you paying $150 for the latest and greatest. While the iPad Air 2 is faster, the speed increase and inclusion of Touch ID probably isn't worth $150.